We Will Match Those Prices. restrictions may apply. See dealership for details. Valid at San Marcos Toyota. Most vehicles. Excludes prior sales. Must present competitor’s current price ad or offer on exact tire sold by dealership within 30 days after purchase. Other restrictions may apply. See dealership for details. 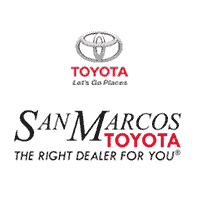 Valid at San Marcos Toyota. Offer expire 04/30/2019.